Simple and functional, this traditional pedestal opens to reveal an abundance of media storage capability. With a contemporary espresso finish, this media pedestal makes a perfect plant or speaker stand while the 10 inner shelves can be adjusted to hold up to 336 CDs or 144 DVDs. With such a functional piece of attractive furniture, why not add more than one to your home? This item features 2 fixed shelves and 8 adjustable / removable shelves and magnetic door closures. 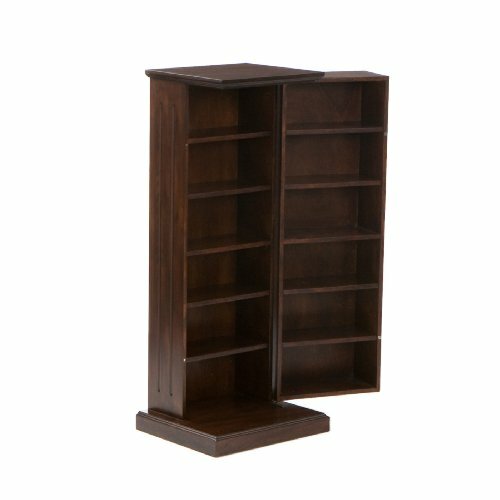 Dimensions include: Overall: 16" W x 13.5" D x 38.5" H; Shelves: 13" W x 6.75" D each; Shelf adjustments every 3". This one-of-a-kind item approximately weighs 40 pounds and can support up to 100 pounds. Only quality materials and manufacturing will do. Product materials include: MDF. Assembly: Required. Made in China.